If you wake up every morning with a sore jaw, you may be living with a condition known as bruxism. 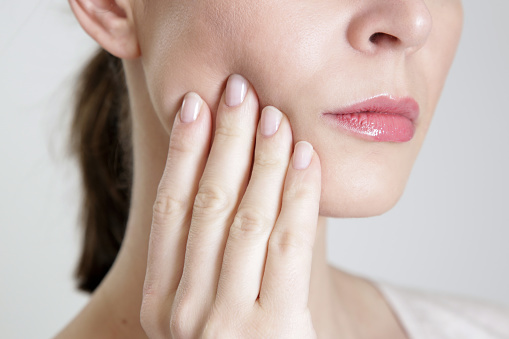 When you have bruxism, you not only experience a sore jaw morning after morning, you may also notice that it has become increasingly difficult to do basic things like bite, chew, and speak. Posh Dental is here to help. Bruxism is a term that refers the grinding and clenching of your teeth. When you grind and clench, excessive pressure is placed on your jaw muscles and your temporomandibular joints. While this grinding and clenching can occur at any time, it is more common at night, when you have no control over your muscle movements. Because of this, you find yourself waking up morning after morning with a sore jaw. Eventually, things that were once incredibly simple, like eating and speaking, become more challenging, and even incredibly painful. • Stress. This is one of the most common causes of stress. Stress causes your muscles, including the muscles in your face and mouth, to become tense. This tension forces your teeth together, which then places excessive pressure on your jaw muscles and TMJ. • Lifestyle habits such as smoking or other tobacco products and excessive alcohol consumption. • Certain drugs, including prescription medications as well as certain types of illegal substances. • Misaligned teeth or jaws. • Pain in your TMJ and your jaw. This pain can often be severe. • Pain or difficulty with biting, chewing, speaking, and more. • Excessive and uneven tooth wear. • Loose teeth. In some cases, you may even suffer tooth loss. • Headaches and earaches. These symptoms are often chronic and result due to pain radiating from your TMJ. • Practicing stress relief. For stress related bruxism, practicing techniques such as deep breathing, meditation, and yoga can help. • Medication. Over the counter or prescription medications can help to alleviate pain and swelling. • Changing lifestyle habits. Quitting smoking and drinking can help to alleviate the symptoms of bruxism. • A night guard. A night guard is a custom fit oral appliance that is designed to be worn over your teeth while you sleep. Resembling a sports mouth guard in appearance, it provides a cushion against grinding and clenching. This helps to take pressure off of your jaw and TMJ. • Orthodontics. Braces or clear aligners can help to correct alignment issues, which can eliminate bruxism. • Oral surgery. In severe cases of bruxism, or when no other treatments have proven effective, you may be recommended for oral surgery. Treating your bruxism can greatly help to alleviate your pain and improve your quality of life. If you suspect you have bruxism, call Posh Dental at (602) 562-9565 to schedule your consultation today.